Daily Illuminator: The Munchkin Holiday Vault Is Now Open! 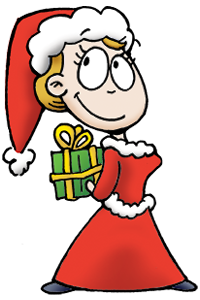 September 26, 2016: The Munchkin Holiday Vault Is Now Open! I can hear the slay bells ringing, which means it's time to reopen the Munchkin Holiday Vault! 'Tis the season for giving, so why not give to the most important person in your life: you. In true Munchkin fashion, it's time to hoard the holiday loot, because it won't be around forever. Use Munchkin Christmas Lite to introduce friends and family to the game (and take their treasure out of their stockings). You can winterize any Munchkin game with it, too. Other ways to inject holiday spirit into your games include expansions like Yule Log, Holiday Surprise, Jolly Jumbo D6, and even the Munchkin Journal Pack 3. Be on the lookout for even more Christmas goodies, like the Munchkin Christmas Monster Box, and Munchkin Playmat: Spyke's Christmas Wish, coming your way later this year. These themed sets will only be available during the holiday season. After that, they'll be going back in the vault, so get them while they're available. Visit your friendly local game store or Warehouse 23 today to put a little cheer in your dungeon diving.